Huiyan Mizhi (1647), the original handbook, had 60 melodies; all are traditional melodies, presumably as learned or taught by Yin Ertao. Huiyan Mizhi Ding (1692) has the 60 melodies from Huiyan Mizhi (sometimes re-edited) plus (as suggested by the title at right) 13 more pieces, all of them apparently created by Yin Ertao himself. However, although the "revised" or complete edition has 73 pieces, these 73 include three revised versions of melodies from the original handbook. Since the QQJC combined Table of Contents includes the original versions as well as the three revisions it has a total of 76 entries. Although the additional 13 titles from Huiyan Mizhi Ding all seem to be new melodies created by Yin Ertao himself, Zha Guide often lists their occurences in Huiyan Mizhi Ding as second after Deyintang Qintong. 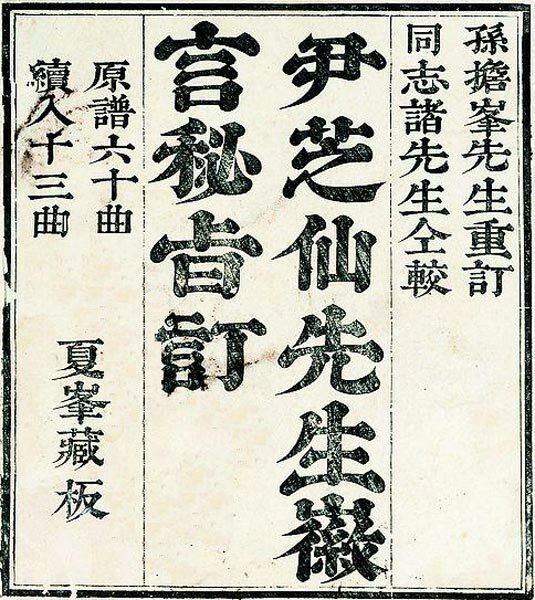 However, the compiler of that handbook must have acquired them either as a student of Yin Ertao, or from a similar source: the Huiyan Mizhi Ding versions should be considered the earliest. Yin himself is said to have been a student of Wang Benwu, a qin master of the Shaoxing School, but after achieving fame there he moved to the capital, Beijing, and spent some years at the court. After the fall of the Ming dynasty he lived for a long time in Suzhou. Xu Jian's introduction to Yin says he was particularly adept at setting lyrics to music as well as creating new melodies. The QQJC edition of Huiyan Mizhi came from the book collection of 王世襄￼Wang Shixiang; Huiyan Mizhi Ding is mostly identical, adding 16 pieces to the 60 from the original. This image, copied off the internet, states that the original volume had 60 melodies while the revision added 13 more.